You are here: Home › Reviews › Review: The Lydiard EB Brütting Road Runner! Arthrur Lydiard is probably one of the, if not the, most influential running coaches ever. I had the privilege of knowing him and doing some work with him in my dark distant past. Whenever I see his name mentioned, I tend to pay attention. Occasionally, I have seen his name used in the context of minimalism running and how he would have supported that. Back when I knew him, minimalism was never a topic of conversation. I recently decided to look into this a bit further, mainly as I used to run in a pair of Lydiard designed running shoes in the late 70’s and my recollection was that they were not even close to being minimialistic! My recollection of him was that he was himself a prominent heel striker when he ran. I checked a couple of books of his I had on my bookcase and in them he never really said much in depth about running shoes. He said things like “…check that they have good rubber soles that will protect you from the impact..” (pg 7¹) and “Well-rubbered shoes are essential to eliminate jarring effects” (pg 212¹). He also believed that forefoot strikers were “more susceptible to foot troubles” (pg 116¹) than those who flat-foot or heel strike. In an interview with RunWashington, he said “We like flexible shoes, to let your foot function. Shoes that let your foot function like you’re barefoot – they’re the shoes for me, as long as they have some rubber underneath to alleviate the jarring.” This appears to me that he believed that the foot should function like it was barefoot (which I don’t think anyone would disagree with), but with padding to absorb the impacts (which is something many would want to disagree with). In the 80’s Lydiard did collaborate with Converse to produce a lightweight running shoe, that was uniquely curved lasted, but was still well padded under the heel with a significant drop between the heel and forefoot. Of more interest to me was his collaboration with the EB Brütting company in Germany that started in the late 1960’s to produce the Lydiard EB Brütting Road Runner as that was the shoe that I was running in in the late 1970’s. I knew they were not what would today be called lightweight or minimalist, so I went searching for a picture of them. 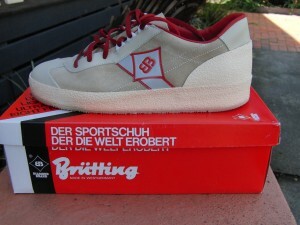 I could not believe my luck, the EB Brütting company still actually make them today and they are just like I remember them! I had to have a pair! They can be purchased at Manufactum’s website: UK, Germany & International. They are not cheap at 168 Euros (~US$224), but I still had to have a pair! When they arrived, I have never been as excited to get a new pair of running shoes as getting these ones. I was checking at least twice a day online with the tracking number to monitor the progress of the shipment from Germany to Melbourne! I was like a little boy at Christmas! They were just like I remember them looking like in the late 70’s. However, I could not believe how rigid and inflexible they were and how heavy they are. I had to use a lot of force to flex them and one shoe weighed 485 grams (17 ounces)! I measured the heel/forefoot drop to be about 10-11mm. So these Lydiard designed and inspired shoes are as far away from being minimalist as you can get – they are heavy; inflexible; well padded and have a 10-11mm drop. I can’t believe I used to run up to 100 miles a week in these shoes! Trying them on, the Kangaroo leather felt great and the inflexibility was not actually very noticeable, and I know after a few runs that it will be more flexible. The drop was not that noticeable either (I have a had a few recent runs in my Hokas and Structures), but the weight was very noticeable (I ran the day before in my Kinvaras and the Minimus’s a few days prior to that). The first run was a disaster. I only planned a short run and just made it down the road and decided to turn around and put the Kinvara’s back on! I tried again this morning to run in them and it was better. I went for 30 mins and decided it was enough. The flexibility in the shoe has improved, but the weight made the running feel ‘awkward’ and I did not feel comfortable. I can’t believe I used to run up to 100 miles a week in these shoes! I am so glad I got these shoes. I don’t think I will be doing any more runs in them. I will wear them as casual shoes for nostalgic reasons and proudly show them off to my colleagues at work on Monday and remind them just how great a Kiwi that Arthur Lydiard really was (for those who do not realize, I am a kiwi, originally from Christchurch). Importantly, these are not close to being the minimalist type shoes that I see so many say that Arthur Lydiard would have advocated. They are wrongly using the appeal to authority fallacy to support their cause. 1. Lydiard, Arthur; Gilmour, Garth (1978). Run, the Lydiard Way. Auckland: Hodder & Stoughton Ltd.
9 Responses to Review: The Lydiard EB Brütting Road Runner! Great article Craig. Looks like the shoe industry did make some progress in the last 30 years after all! I still find it hard to believe that they are still available! Just as a side note…I bought 10 pair of the Converse Lydiard road shoes in the early/mid 80’s. They were, by far, the best road/distance shoes I had worn since the I began running in the late 50’s. I was all in to distance road running and those shoes surpassed anything I had worn. I had a neighbor who wore the racing flat version of these for marathons in the mid 70s. I am very happy to see that they are still made (mine had the day glo orange and looked a bit different than the current model). I am now a Pose runner and favor racing flats and shoes with thinner soles and a zero or close to zero drop, but I would still like to own a pair of these shoes again! Great article! Glad I read it. Was going to purchase a pair, but after seeing the cost and weight, think I’ll give them a miss and stick to my Asics DS Trainers. I have a pair of the original racing version of the Lydiards Bruttings. They had a gum rubber, suction type sole that reminded me of the Onitsuka Tiger Obori that Bill Rodgers used for racing. So nice! Adidas actually made o copy of these called the Muichen 72 and then the Munchen 76 however it had a seamless toe and was abit lighter (not the normakl munchen, this ine cost over $50 US back in the 70s. the toes was alos peforated through the kangoroo. I have a pair of the racing version on display in my running strore. I always thought they were the predecessor to the Tiger Obouri that Bill Rogers raced in. Very similar but kangoroo uppers. with is the Adidas Olympia model which I bought down at Carlsen’s in lower Manhattan back in 66…that was one hell of a shoe…$40 bucks then…kangaroo leather. Couldn’t agree more about the EB shoes, they certainly were not minimal. But in later years Arthur’s shoe preferences went to lighter shoes though still with some cushion. The last shoes he told me he liked specifically were the Mizuno Supersonic and a Brooks racer whose name escapes me now.